All of us are on a journey of life. Some of us are students, some of us are slightly older than our students. All of us need a real relationship with God which shapes our identity, belonging, and purpose. How do we answer the questions? Who am I? Where do I belong? What am I here for? Youth ministry at Grace aims to walk with young people from 6-12th grades as they begin to answer these questions for themselves while learning from other people of faith. Our Open Doors Ministry provides support to individuals with special needs, so that all persons can worship and fully participate in life at church. Grace Church believes in the sanctity of the Confirmation process in the faith journey of our youth. All 8th graders are invited and encouraged to attend this nine-month program, beginning in September and culminating in a confirmation ceremony in the spring at which students are confirmed in the Christian faith and become members of Grace. Confirmation class meets for students on Sundays 9:30-10:30 in Room 231. A Confirmation Parent Class meets on the 2nd and 3rd Sundays in Room 232. Contact Youth Director, Gaye Lynn Loufek (gayelynn.loufek@peopleofgrace.org) for further information. 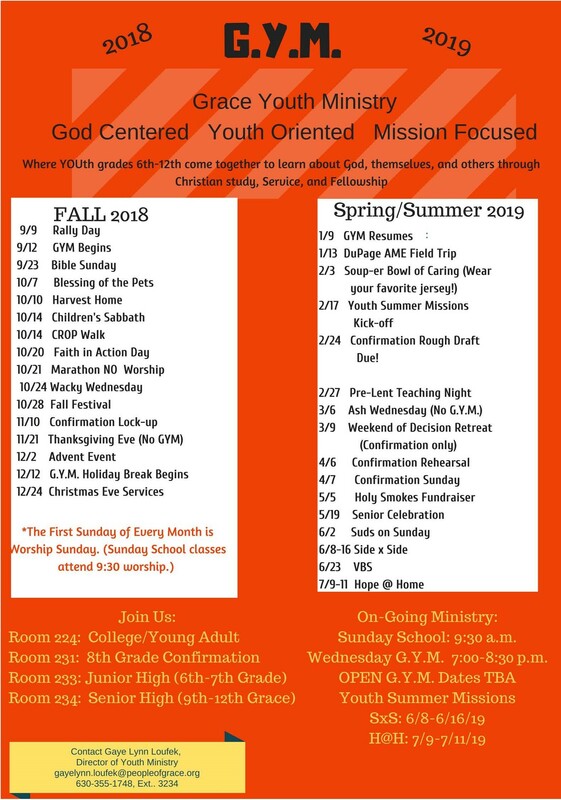 All 8th grade students are invited, and encouraged to participate in our Confirmation Journey, a time of education, fellowship, and faith formation on Sunday mornings. If you did not receive a registration packet in the mail, please feel free to print and complete the documents included here, and return them to Grace UMC no later than Sunday, August 26. Contact Youth Director, Gaye Lynn Loufek (gayelynn.loufek@peopleofgrace.org) for further information. Confirmation students must complete the ONE STOP Registration above, this Getting to Know You Form (this form helps facilitate relationship building within our class) and Confrimation Regristation Packet.